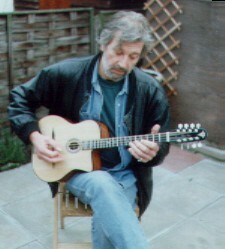 Paul plays guitar, mandolin, and mandola (pictured) with Crazy Rhythm, a UK-based trio that specializes in Django Reinhardt–style string jazz, but incorporates Celtic, classical, and various ethnic influences. (Paul's Crazy Rhythm is not to be confused with Seth Rosen's Ohio-based band of the same name.) Paul's Selmer-style instruments are all built by UK luthier David Hodson. They're available with transducers designed by David himself.